IHG Credit Card's annual fee is $89 and this is a good fee for such a card. 80,000 bonus points when you spend $3000 in first 3 monhts, 10000 points when you spend $20,000 in a year. Total: 90,000 points. There are many travel benefits and insurances of the card. There is no foreign transaction fee of IHG® Rewards Club Premier Credit Card. This will help you to save a lot with a travel card. Consumers are not only earning rewards points with purchasing from a single company. You can earn good amount of rewards points with this card in your vacation/holiday/travel. Cash advance and balance transfer fees are high. Minimum APR for purchase and balance transfer is high. IHG Credit Card (aka IHG® Rewards Club Premier Credit Card) is a hotel credit product which provides several benefits for consumers. You are going to find a detailed review about the card on this page. We will mention about bonuses, rewards points, promotions, benefits, interest rates and fees of the card. You can also see rates and fees table below. It is very important that how you will earn bonus points on credit cards. This is one of those cards which doesn’t ask much consumers to provide bonus points. You will need to spend $2,000 in three months (from account opening) to get 80,000 bonus points. 80,000 bonus points worth is equal to $800. The amount of bonus points is very attractive. If you spend $20,000 in a year with your card, you are going to earn additional 10,000 bonus points. This is not much but still something if your purchases exceeds $20,000 in a year. Actually this is one of the most excellent rewards promotions I have seen. Why? 10 rewards points per $1 is helping you to save 10 percent of your purchases. Besides you are not just earning those rewards points from one single hotel, all InterContinental Hotels Group properties included this. While you are staying in a IHG Hotel, you are going to earn 10x points to all your purchases. If you want to save money in your vacation, this opportunity will be an awesome opportunity for you. So you will able to make your holidays much cheaper. You can earn 2x points on gas, grocery and restaurant purchases. You can also earn 1x points on all other purchase categories. 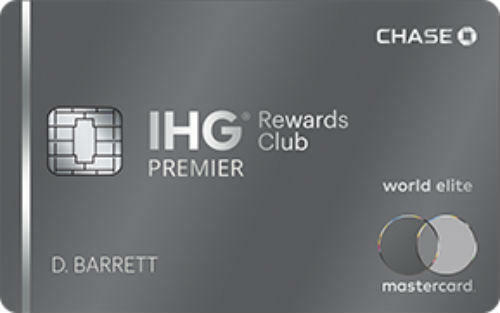 You will also have several benefits with IHG® Rewards Club Premier Credit Card. There are many good promotions that you can use. You will have an opportunity to stay in an IHG Hotel in your account anniversary. This depends on hotel and the time but it means you will able to save about $200-$500. So we recommend you to have this card in dates that you go to vacation. This is another good opportunity for saving money. When you redeem your points for 4 night stay, you will earn a free night stay additionally. So you are going to have another free one day stay in the hotel. You will have these travel insurance and benefits with IHG® Rewards Club Premier Credit Card. Foreign transaction fees is one of the key feature in Travel/Flight/Hotel credit cards for our credit card consultants. We like credit cards which doesn’t ask for foreign transaction fees. IHG Credit Card is one of those cards which doesn’t ask for extra payment at foreign transactions. 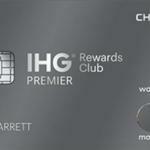 IHG® Rewards Club Premier Credit Card will get extra review points from our experts because of this feature. This is a credit card which provides several benefits, bonuses and rewards points for consumers. $89 is actually a low fee for IHG® Rewards Club Premier Credit Card. Especially we think that minimum interest rate for balance transfers and purchase of the card is high. It is 17.99%. A consumer with excellent and good credit score can question this. Since there are cards with 9%-10% APR and they can be quite profitable for them if their purchases are very high. Maximum APR is fair. Cash Advance APR is also high. It doesn’t matter how is your credit score, all consumers will need to pay 26.99% APR for each cash advances. This is another problem of IHG® Rewards Club Premier Credit Card. 5% balance transfer fee and cash advance fee is high. These fees can also make cards expensive with small differences. For example, this card could be quite profitable if Cash Advance Fee and Balance Transfer Fee was 4%. Our recommendation is 4% maximum for credit cards. You can see rates & fees table below and also editor scores for cards. 17.99% – 24.99% 10x on all purchases when you stay at IHG® hotels. 2x on restaurants, gas, grocery purchases. 1x on all other purchase categories. 80,000 Points when you spend $3,000 in 3 months. 10,000 extra points when you spend $20,000 in a year. Free night stay at account anniversary. Free night stay when you redeem points for 4 night stay. Since I need to travelling much because of my business, this card was amazing for me. When I purchase on hotels, I am earning 10x and additionally 2x on restaurants. I am using this card about 2 years and I didn’t cancel it yet. I don’t think I am going to do that. Agreed it is expensive when you cash advance. However I have other cards for that.